Sorry it took me so long to get this post up. 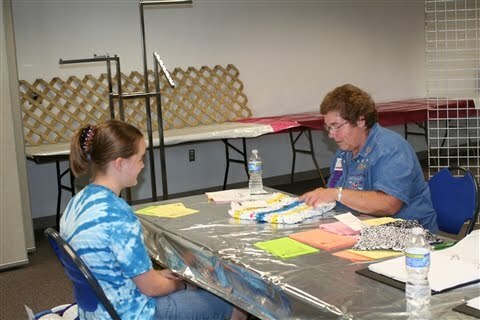 Below is pictures of me showing and some of my projects. 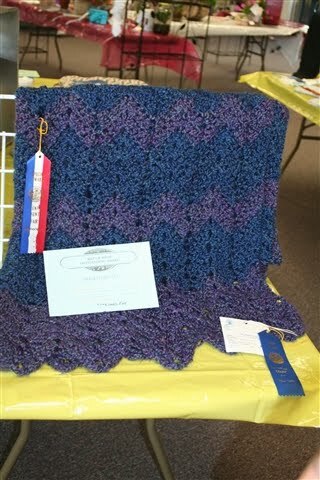 I got Best of Show on my afghan! That is the item for my division - Beginning Crocheting. 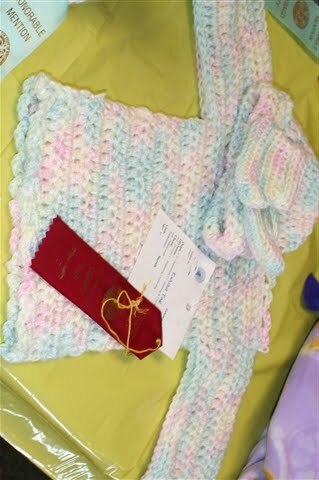 There is also Advanced Crocheting. 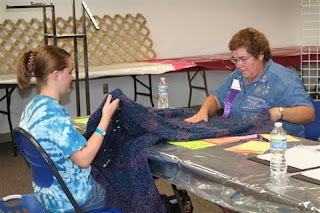 I am not allowed to move up to advanced until I have been in the crocheting project 3 years. This is only my second year. 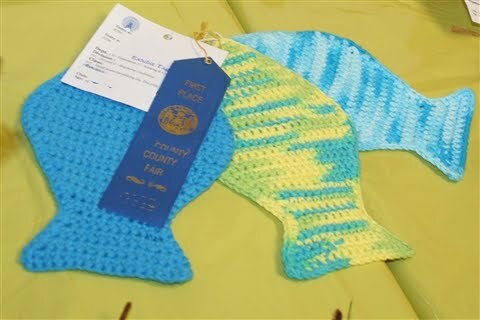 I got a 1st place on my fish! 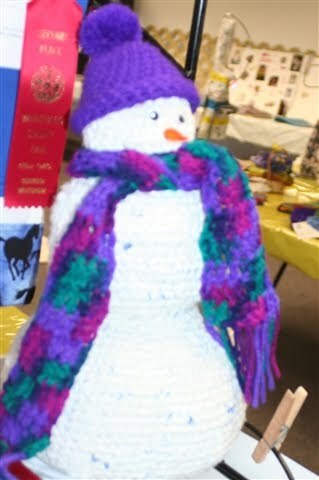 Sorry this picture of Frosty is blury. I'll try and get a better one of his face soon. 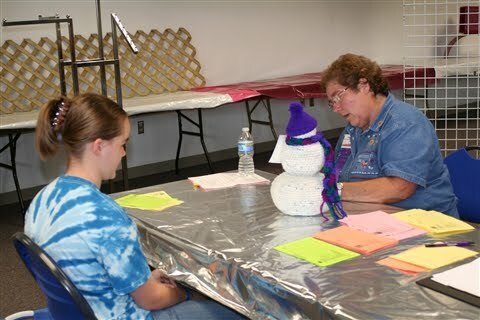 There is a red ribbon next to Frosty's head, but that was from somebody else's project. I got blue on Frosty! Sorry this is sideways, it wasn't like that before I downloaded it. 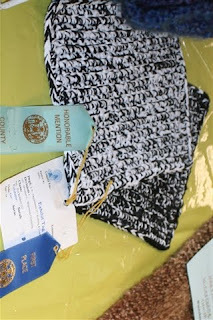 I got a first place and an Honorable Mention on my pot holders. My hat and my scarf, I got a blue on both of them. 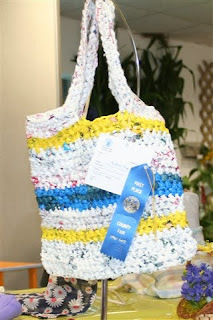 And my plarn bag, which I also got a first on. I would have brought more to the fair, but they don't have enough places to enter things. I am getting that changed for next year. :) I'm very happy with how this years fair went, and I can't wait until next year! I give all the praise to God for giving me this talent to crochet, for how much I've improved, and how I did at fair! OH MY GRACIOUS... 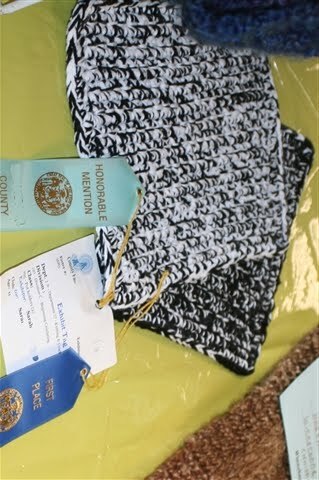 I LOST COUNT OF ALL THE BLUE RIBBONS... Did ANYONE else get ANYTHING?? I bet your mom is just beaming proud of you! You're right, Julia! Her mom IS very proud of her! We all are! Wow that stuff Is REALLY cool!!! What did you use for frostys nose? ?